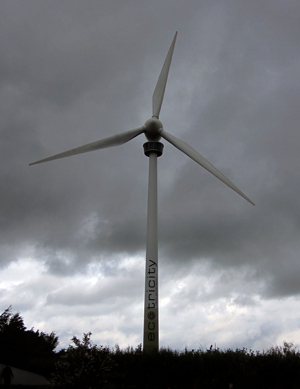 You are here: Home > Blog > Energy, sustainability & economics > When the woodland wind blows …. Winds are critical to our woodlands - they help to strengthen the trees and they spread seeds and pollen. They are also sometimes the main reason a woodland is there, as a shelter-belt to protect housing or agriculture from prevailing winds. But how much notice do we take of wind patterns? Our history of urbanisation has also been a history of moving indoors and many people nowadays spend only a tiny proportion of their lives outdoors. Those who live more outdoor lives become more aware of 'windiness', that is where winds come from and what they bring with them. In many parts of the world particular winds have predictable characteristics so they get named - for example the Mistral which is a cold wind and blows from central France to the Mediterranean, or the Monsoon in the tropics bringing heavy rain. Some winds have names that have become associated with machinery such as the Chinook wind which comes off the rockies in north America and gives its name to a military helicopter. Cars have been named after winds: the Passat, a steady tropical sea wind, or the Sirocco which blows from North Africa to Southern Europe. Wind from the Sahara can bring sand and deposit it all across France and England - this is the Calima wind which blew strongly for several days in March 2014. In Switzerland, the cold wind which blows from the North East is called "La Bise" and is renowned for making Geneva an icy city but there are also famous warm winds in Switzerland - the Foehn or Fohn (roughly pronounced "fern"). This comes down the lee-side of mountains and is very dry because it has already deposited its water, as rain, on the windward side and as it drops down it warms up. It can increase temperatures by as much as 20 degrees, but is also associated with health issues. It is said that the foehn wind increases accident and suicide rates by 10% and many people complain of "Fohnkrankheit" - illness associated with that warm wind. In Britain, wind names are often associated with precipitation (rain and snow) and there are plenty of local names for winds that blow regularly. Before a thunderstorm there is the "plough wind" which is strong and very straight, and there is the "hurly-burly" made famous by the witches in Shakespeare's MacBeth, which is a thunderstorm wind. Winds are both local in character and get given local names which often exist only within an oral culture - in the North East region there is the Helm wind which is a North Easterly, meaning that it blows from the north east. It's sometimes also called "the Cat's Nose" or if it's from the east they call it a "Custard wind". A dry northerly or Easterly wind is called a "dryth". In central England there is the "Piner wind" which is a strong cold wind from the north and north east. Strong winds off the moors are called the "moor gallop". Winds in Britain are usually associated with the colder northern regions or with the sea - for example a "Hangull" is a cold damp wind coming in from the sea, and a "sea turn" is a mist-laden wind. Winds shape our woodlands in many ways - the wind makes the outside trees stronger than those inside: the differences become clear when you look at wind-damaged plantations. 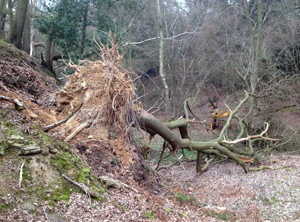 Here the wind often causes devastation inside but the trees at the edge survive relatively unscathed, having previously had their trunks and roots strengthened by years of exposure to gales. 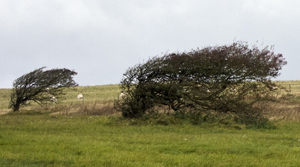 Wind also sculpts individual trees especially where these are exposed and the prevailing wind makes them grow lopsidedly. Winds don't just shape individual trees and woodlands but they affect where in our landscape woods become established - for example there are relatively few British deciduous woodlands on the coast where salt-laden winds from the sea make it harder for trees to flourish. Perhaps as the weather becomes stormier in the next few years we will develop more new names for our winds - or perhaps we'll adopt names from other parts of the world such as the "Elephanta", a strong Indian wind, or the "Sundowner", a wind blowing offshore in California. Hold onto your hats and grab your Sou'westers!